1. In a large bowl or the bowl of a stand mixer place the water, yeast, and malt syrup. Then add in the flour and salt. Knead on low speed until the ingredients are combined then increase the speed to medium and knead for 12-15 minutes. Scraping off the dough hook every few minutes. The dough is very stiff so it is difficult to knead by hand but you just have to be patient and use some muscle to work it. It will take about 15-17 minutes to knead by hand. 2. Place the kneaded dough in a lightly oiled bowl and turn the dough in the bowl to coat all sides with a bit of oil. Allow to rise at room temperature for about 1-1 ½ hours or until doubled in bulk. When you press the dough with your finger the impression will remain. 3. Turn the dough out onto non-floured work surface and cut it into three equal pieces. Roll out each piece into a rope about 12 inches long. Cut each rope into four pieces. Keep the pieces you are not working with covered. Roll out each piece into a 6-8 inch rope, press the ends of the rope together to form a ring around your hand. Seal the ends by rolling with your palms on the work surface. 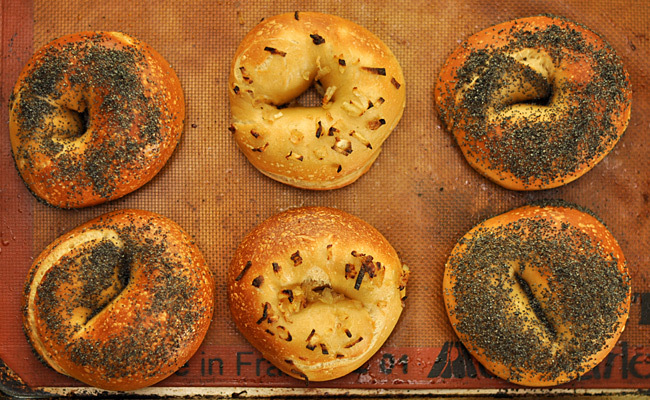 Place the shaped bagels on a parchment lined baking sheet, evenly spaced apart. Allow the bagels to proof for 30-60 minutes. On very hot days they will rise faster than in the winter. 4. Fill a large dutch oven or stock pot with water and bring to a boil. Preheat your oven to 500 degrees with a baking stone placed in the middle of the oven. Fill a large boil with ice water and have it ready for when the bagels come out of the boiling water. 5. When your bagels have proofed put 1 tablespoon of malt syrup into the boiling water. Carefully place 2-3 bagels into the water at a time, they will swell considerably so you want them to have space. Cook for about 30-60 seconds on each side. The longer you cook them the chewier they will be. Lift each bagels out with a slotted spoon and submerge in the ice water for a couple of seconds on each side. Remove and place on an inverted baking sheet lined with a piece of parchment. Sprinkle with your toppings of choice. 6. Baking one tray at a time carefully slide the parchment off of the baking sheet and directly onto the baking stone. Quickly close the oven door and bake for 10 minutes. Rotate the bagels and bake for another 5-10 minutes or until the bagels are a rich golden brown color. Allow to fully cool before eating as is or toasting.